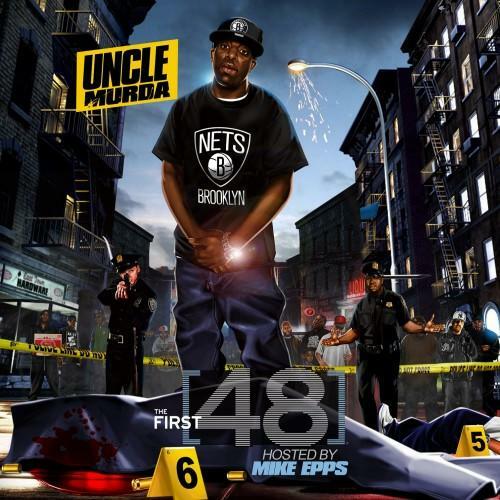 Uncle Murda's delayed mixtape, "The First 48." The 24-song mixtape features Wale, French Montana, Chinx Drugz, Ca$h Out, Mike Epps, Maino and more. Hear The First 48, the latest project from Uncle Murda, released on Thursday, January 24th, 2013. Uncle Murda continues to impress with each new leak, and The First 48 is no exception. It's strengthens Uncle Murda's already impressive body of work, which has seen positive change over the years. We're most definitely anticipating Uncle Murda's next offering. These artists contributed to the mixtape: Cooch From Tuneheadz (Prod By Grandriggity Tunehea, French Montana, Wale, Ca$h Out, Chinx Drugz, Ra Diggz, Diddy Bob, Erup, Ar Ab, Stacks, Chanti McCoy, Diddy Bop, Mike Epps, Maino, Young Super Boii. The following producers soundtracked the mixtape: Clyde Stokes For Tuneheadz, Tuneheadz, Styles For Dangerous LLC, Remo The Hitmaker, The Tuneheadz, Khalil, King Red, GQ Beats, Figgs, Downtime Music, Aiirounda Productions, Omen Audio Blk, Superstar Q, Souldiggaz, Track Bangers, Y.O.P, Profit Beats. Visit our mixtape section to stream and/or download Ain't Nothing Sweet, a project released by Uncle Murda on Friday, February 21st, 2014. It features songs such as Black Yellow, Money Work (Prod By Clyde Stokes For Tuneheadz), No Cake (Prod By Tuneheadz). Hit up Uncle Murda's profile page for the latest info, news, songs, and mixtapes. Check out Uncle Murda's Twitter.